From Vedic Era till 2011 AD, From Epics of Ramayana-Mahabharata till Census of British India, From ruling families of Mahajanpadas till landholding community of British India, From practicing ancient democracies as Gana-Sangha till residents of Bharat Gana-rajya. Read full history of Mall - Sainthwar - Rajput community online at - click here to read covered in 10 chapters, spreading over 450 pages with approximate 250 references of online books written by some well-known authors of India. 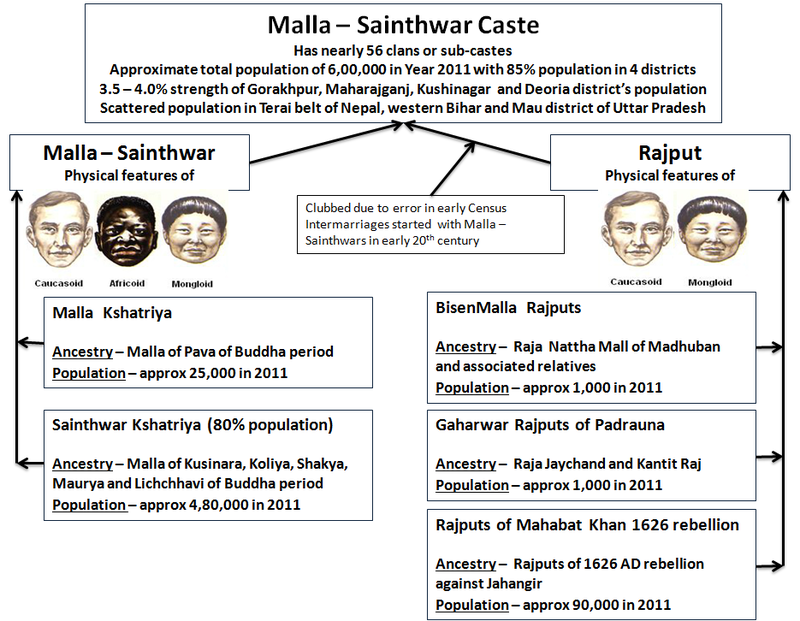 In Gorakhpur Province, the Census of North-West Provinces, 1865 records the population of Malla - Sainthwar caste at 59,823, of Bhumihar caste at 30,739, of Rajput caste at 1,23,238 and of Kurmi caste at 171,005 . There were total 35 castes having occupation or earning source as agriculture in the early census of United Provinces of Agra and Oudh (present Uttar Pradesh) with only 4 castes as landholding castes; namely Bhumihar, Rajput, Sainthwar and Taga (Tyagi)............... click here to read more. Koliya - The Koliya territory was surrounded by the hills of Nepal in the north, by the Mallas in the northeast, by the Mauryas of Pipphalivana in the east, by the Kosala Kingdom in the south and west with River Anoma (present Rapti) as dividing line and by the Shakyas in the northwest with River Rohini as dividing line. Thus the country of Koliya was a thin strip of land spread from River Ghaghara in the south till the northern hills of Nepal. It covered around 32 km from east to west. Their villages figured in the Buddhist literatures are Uttara, Kakkarapatta, Sajjanela, Haliddavasana, Kundia / Kundi and Sapuga ........Based on all these arguments, the capital of Koliyas ‘Ramagrama’ was identified by Cunningham as Deokali - a city between Kapilvastu and Kusinagara, Rampur-Deoria by Sir Karlail, Ramgadh Taal of Gorakhpur by Dr. Rajbali Pandey, Dharmauli by Sir Smith and Vanarsinha village of Nautanwa in Maharajganj district by T.M.B. Buddhamitra ......... click here to read more. Maurya - The Mauryas were known as Suryavanshi Kshatriyas with Kashayapa Gotra. Their territory was surrounded by the Mallas in the north and the east, by River Ghaghra in the south, by the Kosala Kingdom in the southwest with River Anoma (Rapti) as dividing line and by the Koliyas in the northwest who also acted as dividing line between them and the Shakyas. The territory covered roughly 40 km from east to west and 80-90 km from north to south......................... Based on it, the capital of Mauryas is believed to be located somewhere in the Bansgaon region of the Gorakhpur district of Uttar Pradesh .............. click here to read more. Buli - In present time, the area ruled by Bulis cannot be traced except the understanding that it was close to Kusinara as they and the Brahmins of Vethadipa demanded the relics of Buddha and built stupa over it. On the legacy front, the Bulis because of their republican governance, proximity with Kusinara and following Buddhism, could be forming a small section of the Santhavara group of Kshatriyas led by the Mallas (the Sainthwars................... click here to read more. It is evident from many historical events that the republican states took their decisions, either social or political, through common agreement between its members. For this, they had a meeting place or the general assembly point, known as Santhagara. It is a Pali / Sanskrit word derived from the combination of Santha / Sanstha (group) and Agara (the house or assembly point). The membership of the assembly, referred as sangha or gana, was restricted to same clan male adults having a minimum age of 20 years.............. click here to read more. In the entire episode, Brahmin Ambattha accepted the superiority of Kshatriyas over Brahmins based on the social status of children born out of wedlock between Kshatriya father – Brahmin mother, Brahmin father – Kshatriya mother and outcasted Kshatriyas and outcasted Brahmins. Buddha based on above social facts reiterated that ‘whether one compares women with women, or men with men, the Kshatriyas are higher and the Brahmans inferior.............................................Other than the Brahmins, there were people living in these territories whose occupation and social status make it clear that they were none other than Shudras or labor class. However there is no mention of any such word in Buddhist and Jain texts. This class included few artisans who were involved in their hereditary professions such as potters (kumbhakara), smiths (kammara), ivory-workers (dantakar), carpenters (vaddaki) and so on. ......................... click here to read more. By 600 BC, the warrior class raced far ahead than the priestly class with respect to land holding and political power. They also participated and challenged the priestly populations in the field of spirituality and religious activities. Though there can be always a debate on the point that who enjoyed the supreme status in the society till the Gupta Empire, but in the republican states of the east of the Aryavrata they were the Kshatriyas who undoubtedly occupied and enjoyed the supreme position in society. 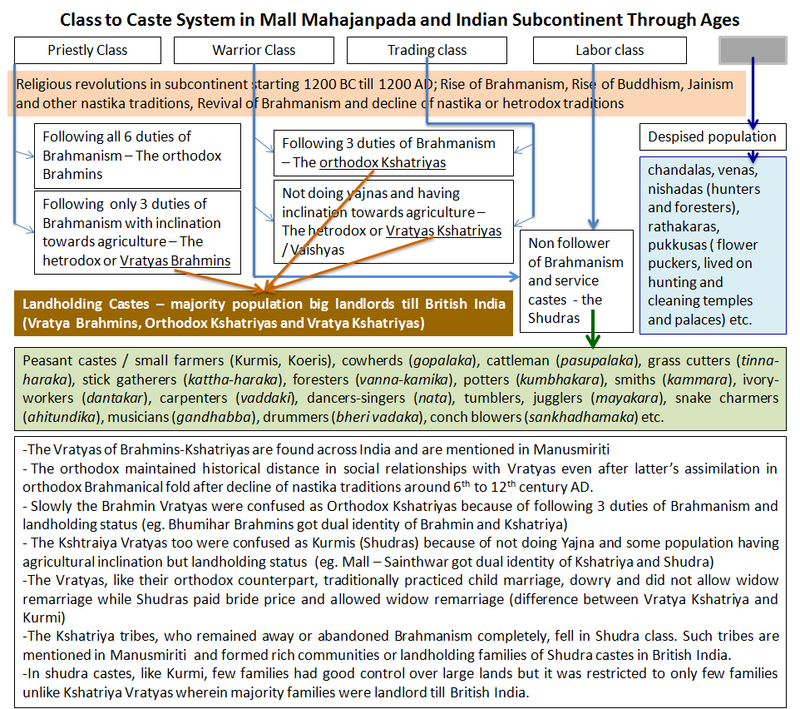 In the enumeration of castes in the Milindapanha (5, 122, 331), the Kshatriyas precede the Brahmins. The superior status of the Kshatriyas is pointedly brought out in the Pali Nidanakatha (i 49) and the Sanskrit Lalitavistara (i 20) . The superiority is also clear from the legend in which Buddha wished to reborn as Kshatriya and not as Brahmin............ Jain Suttas also say that the Kshatriyas occupied the foremost position in society. No Tirthankara was born into a clan other than that of Kshatriya and a legend also says that Mahavira was removed from the womb of Brahmini Devananda and placed in the Kshatriyani Trishala as tirthankara can not born in other clans than of Kshatriyas . This legend clearly indicates the sentiment prevailing in Jain followers of that time about the greater status of the Kshatriyas over Brahmins.................. click here to read more. Some Kshatriya personalities of these republics whose name frequently appears in various Buddhist texts are – From Shakya clan: Ananda, Bhadidya, Aniruddha, Bhirugu, Mimbil, Devdatta, Rahul (son of Buddha), queen Mahaprajapati Gautami, princess Tishya, Abhirupa Nanda, princess Mitra, princess Sundari Nanda alias Janpad Kalyani Nanda etc. From Malla clan: Pukkush Malla Putra, Dabba, prince Siha, prince Yashdant, prince Godhik, prince Subahu, prince Wallilya, prince Uttaim, prince Suman etc . From Lichchhavi clan: Mahali Lichchhavi, Mahanam Lichchhavi, Abhaya Lichchhavi, Mandak Lichchhavi, Maddip Lichchhavi and Ottha Lichchhavi were main upasakas of Buddha. Prince Bodhi, prince Abhaya, prince Jaysena, King Udayan and King Papasi also figured as the upasakas of Buddha........... click here to read more. In the next 100-150 years after the Buddha’s parinirvana, republican states as independent powers were completely vanished. In the period of the Nandas, the Kshatriyas of the republics were killed in masses and the female Kshatriyas were made royal servants. Buddhist literatures like the Digha Nikaya, Mahavamsa and Divyavadana suggest that in a war with the neighboring Kingdom, the Maurya chief of Pipphalivana village died leaving his family destitute. He died while serving as loyal troops of Shishunagas who fought with the armies of Mahapadma Nanda. His helpless widow Mura was escorted by her brothers. She escaped to the city called Pushpapura (also known as Kusumapura or Patiliputra) where she gave birth to Chandragupta in 340 BC . The families of displaced Kshatriyas were living in hiding from... click here to read more. The disappearance of Buddhism in eastern Uttar Pradesh: In the midst of these developments the Buddhist center of Nath Sampradaya, situated in Gorakhpur district of Uttar Pradesh, finally embraced Shaivism leading to the merger of Buddhism and Hinduism in one fold. The merger was facilitated by Guru Gorakhnath who, according to Bengal and Tibetan traditions, was originally a Buddhist* but after accepting Shaivism put great efforts for merger of the Mahayana sect of Buddhism with Hinduism. All these factors................ click here to read more. In Kshatriya populations, similar to Buddhist Brahmins, few who never left their Brahmanic rituals completely even after adopting Buddhism, retained their Vratya Kshatriya status in view of orthodox Brahmins after the extinction of Buddhism. This is evident from the example of Gupta King Samudragupta............... click here to read more. Other than the human form of elephant headed deity, the worship of stone images of elephant having appearance of Vahana continued in the regions belonging to ancient republics or the land of initial Buddhism i.e. Gorakhpur and the surrounding regions of eastern Uttar Pradesh............. Click here to read more. In the census, the regions which had large Dravidian, Mongoloid and Negroid population and followed anti-Vedic faiths such as Buddhism, Jainism and other aboriginal cults, show a higher Shudra Varna population that also included despised and out-caste populations. On the other side, the epicenter of Brahmanism and the settlement of Indo-Aryans i.e. Uttar Pradesh and Rajasthan recorded the highest upper caste population.................. click here to read more. The Census of North-West Provinces, 1865 records the population of Sainthwar at 59,823 and 2,573 under the title of ‘Koormi Sainthwar’ in Goruckpore and ‘Mull’ in Azimgurh respectively........... click here to read more. The ancient texts mention Malla, Maurya, Shakya and Koliya as the few ruling or warrior tribes in and around Malla mahajanpada. Within them, the Shakyas and Koliyas are especially shown as agriculturist tribes. Except Koliya who are referred as Nagavanshi, the other three tribes are referred as Suryavanshi. As Koliyas were serpent worshippers, the tribe belonged to Naga populations. The same is confirmed from the visit of Ashoka to Ramagrama, the capital of the Koliyas. Ashoka encountered a Naga King worshipping the stupa built by the Koliyas............ click here to read more. The Bisens are not mentioned in Rajputana anywhere and were never a historical figure before the period of Mughal Emperor Akbar. They rose to prominence only after their good services to Mughal Empire and after migration of Rajputs in these regions in the medieval period. The literary meaning of Bisva Sen, big population number spread across some districts which is the land of initial Buddhism, five different clans and gotras support the view of A.H Bingley that Bisen is probably a title adopted or given to a group of Kshatriya tribes........... click here to read more.